Dread headband These young girls from the Ethiopian Kara tribe laid dreads across the top of their heads, halfway back, giving the illusion of a permanent headband, which makes their facial features really pop. Beaded braids With beaded braids, you could coordinate your hair with your outfit every day. And the swish-swish sound when you turn your head is kind of seductive. Partial mohawk Admit it- you’ve fantasized about cutting a mohawk just to let people know you’re a bad…. African women in many tribes get to wear one without being called a tomboy — it’s just the norm! Frontal headbands In the Afar tribe of the East African countries of Djibouti, Somalia, Ethiopia and Eritrea, women wear elaborate woven headbands that usually drape down the center of their faces. 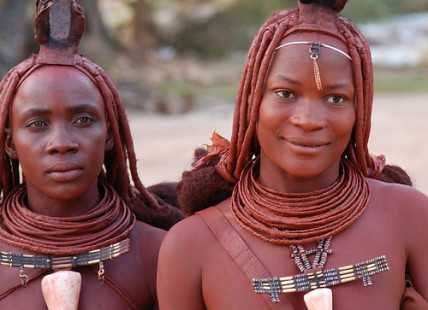 Clay-covered dreads In several tribes of the Namib Desert, women wrap their dreads in red clay. Trinket braids In the Ethiopian Daasanach tribe, women often braid various trinkets from wooden beads to bottle caps onto their headwraps. Wouldn’t it be awesome to choose your favorite items and put them on a headwrap? Dreads This is an obvious one- wouldn’t it be incredible to never have to brush your hair again? And dreads look so cool when they’re pulled up and twisted into a bun.